Button Flash Nine: Breaking the Rules with MLK Jr.
To commemorate Martin Luther King Jr. Day, I’m breaking all the rules. For this, my Ninth Button Flash Story, I’m disregarding arbitrary word and time limits. And, here’s the kicker: the piece you are about to read is not even fiction. This is why. In October, I toured the Martin Luther King Jr. National Historic Site in Atlanta. I’m embarrassed to admit that this was the first time I had ever visited despite the fact that I’ve lived just a few hours away from Atlanta for most of my life. I didn’t know what to expect other than the fact that the site included MLK Jr’s childhood home and church. I was afraid it might be a little sparse and cheesy, but we were happily surprised to find a richly stocked museum, a pleasant self-guided walk through the Sweet Auburn neighborhood, plus an adjacent family-run museum and tomb site. We started our visit with Ebenezer Baptist Church, where King, his father and his brother all served as pastors. Ironically, the church was remarkable to me because it was so incredibly unremarkable. It could have been any number of Southern Protestant churches I’ve been in over my life, especially from that era. The dark wood pews, the red velvet curtains in front of the baptistery, the hymn numbers posted on the right side, the flags . . . it all felt strangely familiar. Listening to King’s powerful voice from the day before he died, witnessing the reverence of the other visitors, being surrounded by this familiar yet spiritual atmosphere all came together to create one of those semi-electric moments when you can sense an energy or a message or a presence—a something– that is both beyond yourself and beyond that particular moment. …. And then it was over and we were walking out of the church. My daughter grabbed my arm. “A button!” she said, pointing inside a basement window sill. Of course, for most people, this would be a non-event. But, there I was, a person who wrote a book named The Button Collector and who is always on the look-out for stray buttons with stories to tell, and there was a button seemingly placed right there just for me inside King’s church. 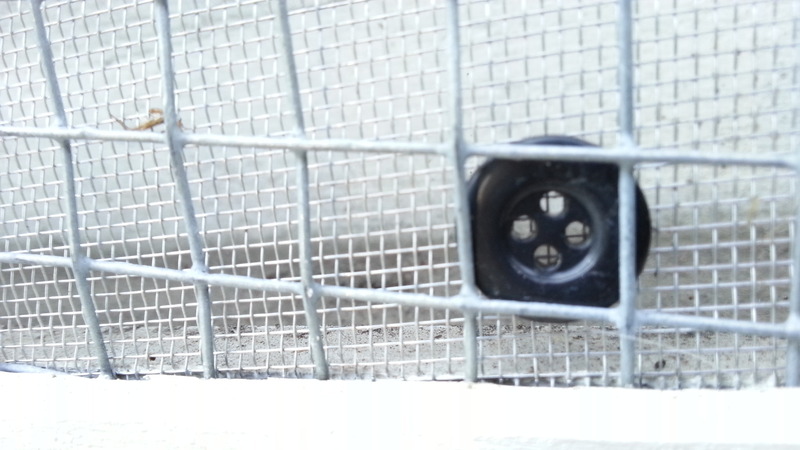 I’m not even sure how it got there because the window was covered with a tight wire mesh, but there it was. And here it is in cyberspace, a little poignant reminder of that day and the things I learned about one of the most influential leaders of our country—about his relatively affluent and safe childhood and how he chose to risk that to improve the lives of others, about his meticulous attention to detail, about his deliberate study of Gandhi. 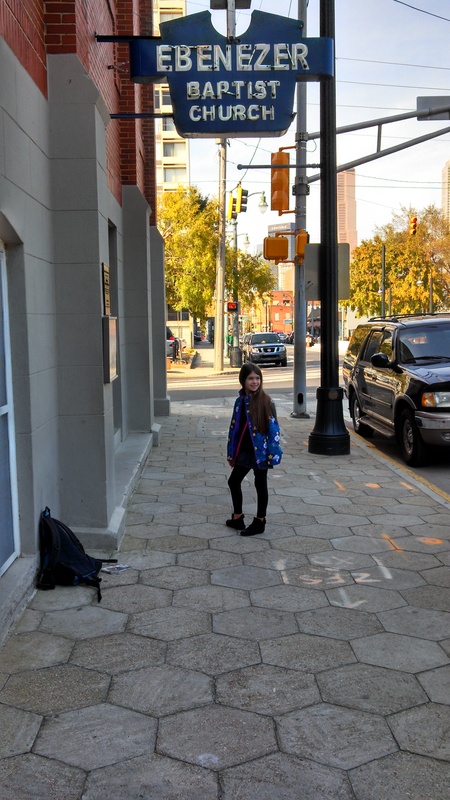 It also reminds me of the not-so-lovely things about that visit, particularly the many homeless people we saw as we walked the very short distance from the King site to our hotel in the heart of downtown Atlanta. In hindsight, I would have chosen to take a taxi back, especially with my daughter, but we stayed safe and I like to think that walk was part of the overarching message we took away from the visit: the struggle for justice is far from over. Do you have a button with a story waiting to be told? Email an image of it to ej@elizabethjennings.com and I’ll write a flash fiction piece and post it on an upcoming blog. Click here for details and for your mid-winter reading, don’t forget to check out my book, The Button Collector. This entry was posted in Uncategorized and tagged atlanta, button, civil rights, Flash Fiction, martin luther king jr.. Bookmark the permalink. 1 Response to Button Flash Nine: Breaking the Rules with MLK Jr.